See 10 Australian celebrities, who have a unique proposing style & are high on their flirtation scores. Hey you RPG Lovers here are some insights over the latest version of Diablo. Go on to the next level! The seductive companions of the world famous agent James Bond through history. Beauty never fades! The notorious Who! Starting from 1963 till today and covering 26 seasons so far, this is the timeline of the actors starred in the most classic role ever. 37 and counts! 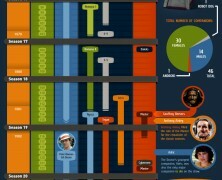 This is the history of the most popular and longlasting primetime TV show. Just an idea from Cheap Cruises. This Christmas why not go sailing? Here you will read about the most popular destinations, departure ports and typical durations. Here is a critical view on the originality of the films that Hollywood industry has released through the last 4 decades showing a plausible decline in uncoventional creativity, A lot thought should also be invested in the fact that this situation has radically turned over the previously snobbish look against sequels and remakes. People from kids to elders like playing games. See here a quick market report for the famous 3 consoles and the change they have brought to media consumption. They are the symbols of momentous times, spectacular celebration or dazzling fun. However, setting up a firework show is a sophisticated process. 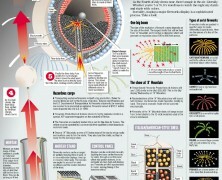 Go down the core of explosion. Perfectly fitted to the script concept, this is dedicated to Breaking Bad fandoms. With 247 total deaths in this tv show spike it’s hard to calculate and tell which party trumps. Look into this periodic table and claim your diploma in “death chemistry”. Model train hobbyists and new comers will love these best railroad museum recommendations by ExactRail. Find what you need to know and where to go to get the most of your “journey”. Spotify, the fresh music streaming service skyrockets and celebrates its success boasting by nubmers. What’s the relation between chemistry and some of the most popular TV shows? 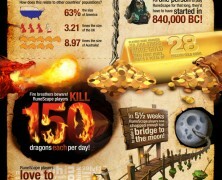 Interesting facts for the one of the most popular MMO RPG games. This ins’t what makes a hero but what a hero makes. Get to know better the financial state of the most famous superheroes undisguised. Her real name is Stephanie Lynn Nicks and here is her biography on a timeline. Thh most beloved consumer brand in the history releases its timeline – a tribute to its 40 years Anniversary. See which tv shows and series from the top US networks skyrocket in the social activity.